We offer Side & Face Cutter Milling Machine to our clients these are widely used in the milling industries. It is designed with cutting teeth on its side as well as its circumfrence. They are available in different sizes and diameters. Backed by a team of adroit professionals, we are manufacturing and supplying an extensive array of Side And Face Cutter. - Used for cutting different types of metals in various industrial sectors. 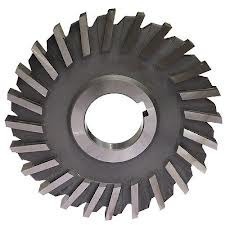 We are offering Side Milling Cutter. We are one of the leading suppliers in Side N Face cutters in the industry which covers possibly entire range of sizes in Straight teeth and staggered teeth. Side and Face Cutters are supplied from dia 50 mm to 300 mm & width from 5 mm to 50 mm. As per ISS & B85 in M2 & M35 material.Others products includes slitting saws angle cutters. 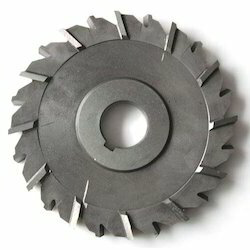 The side-and-face cutter is designed with cutting teeth on its side as well as its circumference. They are made in varying diameters and widths depending on the application. The teeth on the side allow the cutter to make unbalanced cuts (cutting on one side only) without deflecting the cutter as would happen with a slitting saw or slot cutter (no side teeth). Side & Face milling cutters are profile sharpened cutters, having a teeth on periphery and on both sides. Used on horizontal milling machine to mill slots, shoulders, small width surface etc. Our customers can avail from us an exclusive range of Side & Face Cutters. These cutters are fabricated using high-grade steel and carbide brazing Tools. Our side and face cutters are highly acclaimed for the distinct features like long sized blades, manual operation and anti-rust surface.